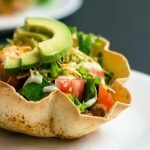 Here is a fun and different way to have a salad, if you have picky eaters I guarantee that they will eat this salad because its just like eating a big taco but without the mess. I don’t know about you but I hate the hassle of eating tacos because it can get so messy and all the filling ends up on the plate anyways. You can use any minced meat you like. I like using ground lean chicken for a healthier option. In a large non stick pan, heat the oil and place the minced chicken, garlic and onions. Fry until chicken is almost done, add half of the pack of taco seasoning and salt and pepper to taste. Transfer to a bowl and set aside. Using a metal bowl or any heat proof bowl place the tortilla in it folding the edges to fit the bowl perfectly. You can oil the bowl so that the tortilla won't stick to it. Broil on low until the edges are golden brown and the tortilla is crisp. To assemble: Spread a tablespoon of heated re-fried beans at the bottom of the tortilla shell, put desired amount of meat, add generous handful of lettuce, add the chopped tomatoes and avocado. Drizzle the top with the dressing and sprinkle the cheese on top. 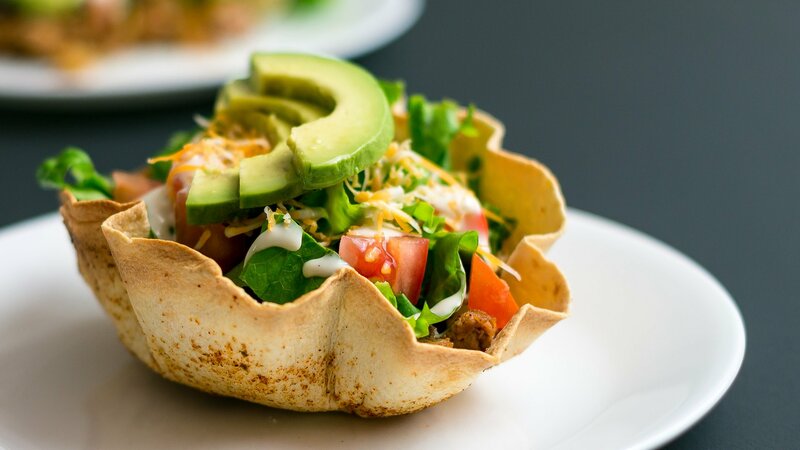 Now your taco salad is ready! dig in! What’s In My Cookie Jar? Hello, I really like your website! This salade looks really tasty 🙂 Is there any way to contact you by email?